I have two boys. 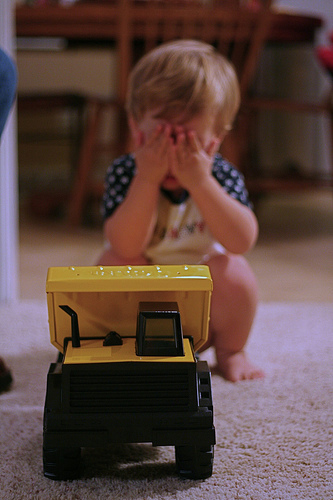 When my now-15-month-old turned one, a close friend bought him a Tonka dump truck. It’s big enough for us to push either of those critters around in it. The little guys love it so much that my 3-year-old politely demanded that he get his own Tonka when he turns 4. But as a kid, I loved machinery and vehicles, too. Many a righteous little girl knows how to rock out a dump truck. So when I saw this from a Facebook friend and mother of a girl, I completely understood. Any parent of boys and girls alike know that some girls like to play in the mud as much as some boys like to play with dolls. Kids don’t really get the gender thing when they’re very young until we teach them what they “should” be playing with. I have a Tonka Rumblin’ Rollin’ Crane that my child greatly enjoys. I came to your website today looking for another piece to add on, since trucks are a big hit around here lately. My complaint is that your language is so gendered! My child is a 20 month old GIRL and like most of her similarly aged female friends, loves trucks, cars, trains, and playing outside with rocks and dirt. Not only do today’s girls get dirty and play in the dirt, so did their mothers thirty years ago! Hasbro, please, get yourselves out of the 70s! Image: bionicteaching on Flickr under a Creative Commons License. Yeah! That’s awesome. I had a Tonka when I was a little girl. It was blue, too! Thank you for a really well thought-out post. It’s true. All of it. And as the mother of two boys, I think gender expectations are even stronger for boys. Sean mentioned Barbie, but as you pointed out, G.I. Joe is the more acceptable form of a doll for boys. “Tomboy”. Not so bad, huh? “Mama’s boy”. “Sissy boy.” Are there any KIND terms for a boy who likes “girl stuff”?! We should just let kids be kids. But we’re human, and unknowingly, I’m sure we foist our gender expectations on our children, no matter how well-meaning we are. I certainly hope you also contact Mattel for targeting their line of Barbie toys exclusively at GIRLS! Come on, people, marketing is targeted at the largest share of the market. That’s business. If your girl likes trucks or your boy likes dolls, that’s fine. The marketing is the marketing and it’s not likely to change until the demographics change. When girls who play with Tonka trucks are a substantial market share, you’ll see them targeted. I fully support your stance with regard to the responsibility that Hasbro has to a society it sells to. Advertising is so very powerful and pervasive today that there is a great emergent responsibility that companies need to heed with regard to the messages they produce in the name of sales. Naturally, I understand the stance from Hasbro’s point of view; although I do find it short-sighted. If I were to guess I would imagine that boys rank as a highly effective demographic to market to where Tonka toys are concerned (see Tom Hank’s ‘Big’) for an excellent illustration of the human dimension here. As a male of 35 years I had all the requisite interest in ‘boy’ things and ‘boy’ activities as I grew up. I had a Tonka Ford Bronco (more subtle marketing there, but I digress), I played with G.I. Joe toy including scale representations of F-14 Fighter Jets. At this point in my life I feel that a great many of these assumed conditioning factors affect both men and women. Men grow up in these gender expectations too and it’s no wonder they get adjusted to the notion that the application of force is the way to get things done. As far as the ‘girls’ are concerned I always tended to appreciate the friendship of the ‘tomboys’. They were assertive, they knew what they liked. Instead of having a power dynamic we could share points of view. I have always found that the points of view of boys, girls, men, and women can ford the entire spectrum of what we stereotypically think of as decidely male or female in nature. It is not for me to foist my personal opinion on others by any means, but I will say, in my opinion: that we’d all be better off if we met each other in all our relationships with no assumptions of what it means to be male or female. Let’s face it; G.I. Joe got his start as the acceptable form of a doll for a boy. I see no reason why we would choose to limit the explorations our children make into the nature of their being. The seventies were actually rather progressive when it came to gender roles. Give Sprig a try, they are made of recycled plastic and wood scraps. They look really cool too. I totally agree with the letter. Once Tonka started showing those horribly gender-biased commercials on television, I vowed not to buy their brand again until they changed. Hi, I’m the Heather from the original note. I thought you all might be interested to see Tonka’s response. I understand enough of how marketing works to know that if Tonka *wanted* girls to be a significant market share, they would change their plan in a snap. Marketing is a powerful force that has the potential to change cultural mores. (Diamonds, anyone?) It’s not as simple as saying that if more girls played with trucks they’d change their language. Matt, I really appreciate the link to Sprig toys. Given Tonka’s response, I’m much more inclined to buy elsewhere. non-traditional toys. My daughter is totally into Spiderman, and I LOVE IT! neutral as well as gender specific. and moms of little boys. light on our marketing strategy. WTF?! Because only moms buy children toys? Hasbro/Tonka totally missed the point. Yeah. For L’s 4th birthday, I’m going for the Sprig trucks. He’d love it, it’s eco-friendly, and (I checked), they’re about the same size as the Tonkas. As the mom of 2 girls and 1 boy, I’ve been surprised by how early gender-based preferences show themselves. I can remember being at a children’s museum with my oldest DD when she was only 15 months and trying to interest her in the pretend fire station, ball room, and other exhibits with no luck. All she wanted to do was play in the pretend kitchen with the dolls (sigh). My DS, on the other hand, at the same age loved trucks and balls and couldn’t have cared less about dolls. I certainly wasn’t pushing dolls on my girls or trucks on my boy- if anything I was trying to get them to have a broad range of interests. They ignored me and went right for the stereotypical toy for their respective genders. I should also mention that one time I asked a SAHD I know whether his kids (he’s got one of each) show more androgynous interests since they see him taking care of the home and their mom being the breadwinner. Nope, he’s still got a doll-loving girl and a truck-loving boy.